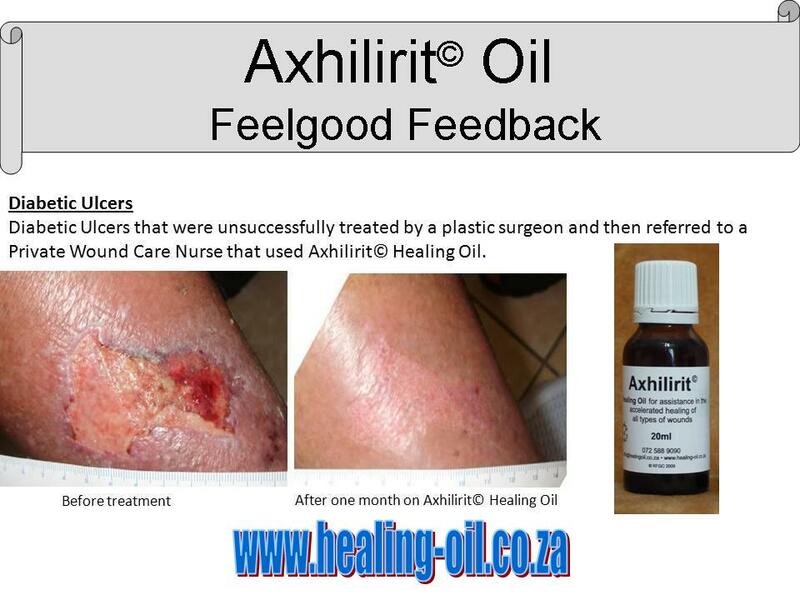 Axhilirit© HO Healing Oil has been found to heal previously problematic wounds in many clients. Some clients had skin ulcers for up to 25 years, or wounds that simply refused to close up and heal. Any open area larger than 4cm in diameter is considered large and might need a temporary bandage or plaster for comfort. Ulcers should be cleaned with a saline solution to protect new skin growth. Gently pat the area dry after rinsing and apply Axhilirit© Healing Oil 2-3 times a day until the ulcer has closed and new skin has formed. As Axhilirit© encourages blood flow and simulates a temporary skin, there should be minimum formation of granulation of flesh (keloids). The body might secrete plasma (yellow watery fluid) to assist in the healing process. This is a natural healing process and should not be seen as infection unless there is a foul smell that accompanies the fluid. If infection is suspected, dust Antibiotic powder over the wound before applying the Axhilirit© Healing Oil. Consult with a healthcare practitioner as anti-biotics might be needed. Continue with treatments as normal until wound is completely closed. Note:The above is based on the personal opinion of the writer. The information has been compiled from 20 years of personal experience, feedback from qualified wound care personnel and other clients.